If Labor Day is the unofficial end of Summer, then we have unofficially started the Fall with some of the hottest weather of the year here in my little piece of the world! I don’t know about you guys, but I’m ready for snowboard season…bring on the SNOW! This Summer I spent a lot of time out in the sun playing in the water with the kiddos. I think you will be able to tell by this group of favorites from the last 3 months. Sunscreen: We all know that we should be covering up with sunscreen everyday. Not only does it defend against scary things like skin cancer, but it also keeps our skin looking younger longer. And at 33, I need all the help I can get in that department! This year I started seeing sunscreen oils and was intrigued. I can’t stand the time and effort it takes to put on lotion and my skin is always left feeling sticky and just plain gross. On top of that, my skin has started to react to sunscreen lotions by burning and itching on top of getting super dry after I wash it off at night. The sunscreen oil sounded like it might offer a different experience. I grabbed a bottle of the Supergoop! Sun-Defying Sunscreen Oil with Meadowfoam Broad Spectrum SPF 50. It was AMAZING! I put it on in the morning it sunk straight in leaving my skin feeling nourished and not tacky. It had a very subtle scent that I barely noticed. And after a day with one re-application, I didn’t feel like I had been rolling in a tar pit. I did not burn one little bit all Summer with this on! This sunscreen has quickly become my holy grail. Pedicure: During the Summer, when our toes are on display with cute sandals and flip flops – or like me, when you go barefoot – a good pedicure is a must! I am obsessed with corals, and not even just for Summer. It looks great with a tan and is bright and cheery for sunny days. I had one polish on my toes ALL Summer and it was Trout Pout by Butter London. It is the perfect coral peachy pink for my skin tone. Plus, it matched my bathing suit! 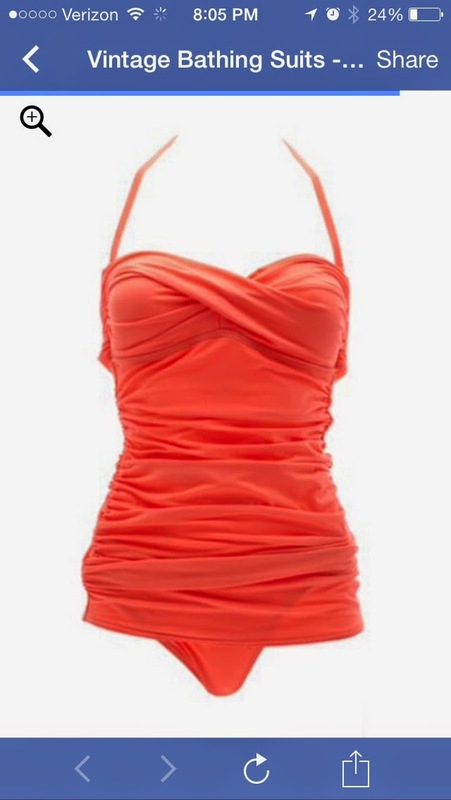 Bathing Suit: Speaking of bathing suits…a girl needs THE perfect bathing suit when the Summer months roll around. There is no easy way to find said perfect suit, and it can take hours, if not days to do! Because I spent a lot of time with family and the general public – at beaches and such – I wasn’t about to display my (never beach ready) body for all to see. So, I decided on a super cute one-piece from Charlotte Russe. It is a flattering cut, but doesn’t make me look like a frumpy 30-something mother of 2 (yes, I am, but I don’t wanna look like it!). Plus, it’s that amazing coral peachy pink color that I’m mad for at the moment! And at under $20, it was an absolute steal! You can’t get this exact one on their site anymore, but I’m sure you can find something similar next Summer season if you keep your eyes peeled. Leave-In Conditioner: During the warmer months, my hair tends to need some help when it comes to tangles. As soon as it gets wet, it knots right up. So I grab some leave-in conditioner and let it do its thing before I ever put a pick or my tangle teezer to my head! This Summer I picked up the Aveeno Active Naturals Nourish + Condition Leave-In Treatment and it worked pretty well. It didn’t have a smell and it didn’t seem to weigh my hair down or make it greasy. You can pick it up from just about any drugstore and it’s super cheap at $5.99. I wouldn’t say it’s life changing, but it got the job done. Ice Cream: Finally, it wouldn’t be Summer without ice cream! When we go on vacation, ice cream is a meal in itself. There is Breakfast, Lunch, Dinner, and Ice Cream! I swear I’ve put on 10 pounds from it! And although, when we are at the beach, we like to grab it from our favorite frozen custard place (Kill Devil’s), when we are at home we are just as crazy for frozen treats. My lovely hubby made the mistake of bringing these *Klondike Heath Ice Cream Bars home once and we were all hooked! I love Heath Bars and vanilla ice cream, so this was a natural choice. When I got a coupon from Influenster to grab a box for FREE, I was all over that! Free ice cream?! Who would turn that down?! Who, I ask?! Anyway, these quickly became my family’s favorite frozen at-home treat. If you like ice cream and chocolate, check ’em out! We got ours from our local Target. Although I am ready for the cooler months, we had a great Summer, and with my favorites around it couldn’t have been better! Here’s to the Summer of 2014! What can you not live without during the heat of the Summer? This product was sent to me in consideration for a review free of cost to me. My opinions are always my own and are genuine!